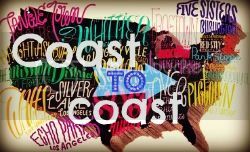 If you have been reading my blog for awhile you know that I struggle with nutrition during training workouts and races. I seem to have my nutrition figured out for pre-race/workout and on the bike, but nutrition on the run still alludes me. I have tried chews while running but I feel like I can't breathe (I love them on the bike, though). I tried a variety of flavors and thought that I had found one that I liked, mocha, and then it started to not sit well with me during half marathon distances or longer. I can tolerate raspberry and strawberry flavors, but the kinds that I have been using don't always sit well with me either. I usually end up skipping my last energy gels during long races (and I even did that on the run leg of Musselman 70.3). 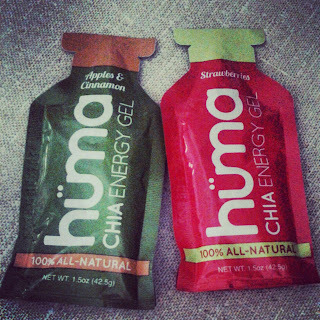 I had seen quite a few bloggers do a review of Huma, a chia energy gel, and I was intrigued. At first, since so many people reviewed it, I thought it would be like every other product that hits the blogging scene: too good to be true. Then, I saw that Carrie reviewed it and I knew that I wanted to try it since I trust her opinion. I was sent the two current flavors, apples and cinnamon and strawberries, to test out. Currently, Huma is undergoing an Indiegogo campaign to get two more flavors on the market: blueberries and mangos. The blueberries one sounds delicious! Admittedly, I did not try these gels out on the run. Since I received them close to Musselman I didn't want to mess my stomach up. However, that is one of the claims of this energy gel, that it won't give you stomach problems. Still, I wanted to be safe and tested both out prior to two bike rides. These gels taste great! I tried the apples and cinnamon flavor before a 38 mile ride with Mike and Amber (though, Mike did get a flat). It sustained me until about an hour into our ride when I started to take energy chews. I never felt like it messed up my stomach either. I would eat this energy gel for dessert (semi kidding)! The strawberries energy gel was just as good, though I would pick the apples and cinnamon one if I could only pick one to have forever. I took that one before a 34 mile ride with Amber, Greg and Mike. I didn't even take any water with it (though I would not recommend that) and I never felt any stomach discomfort at all. Huma energy gel not only tastes great and doesn't give you any stomach problems, it is also made of all natural ingredients. The apples and cinnamon flavor has 8 ingredients and the strawberries has 7 ingredients, and you can pronounce and recognize all of them! The only cons that I found with Huma is that it is a little bit pricey and only available online (from what I researched anyway). However, if I can take it in during a long distance run, and not have it bother my stomach, then I would be a happy camper! I do want to try Huma energy gel some more to see if it would work with my training and racing. I would definitely suggest that you try Huma energy gel! I was provided Huma energy gels to try at no cost to me in exchange for a review. I was not compensated in any way and the thoughts and opinions expressed in this review are, as always, my own. Hm, sounds like something I should try. I also have a gentle stomach and have to be careful with my fueling. I had great results with Huma Gel and look forward to the new flavors. The only thing I found a bit funky was the lumpy chia consistency. These are my favorites! I just wish they weren't so expensive. I struggle with fueling on the bike and run as well. I hate the consistency of gels and chews. These feel like applesauce to me, which I like. Yummy, I loved the apple and cinnamon sample too!